Gabrielle Lamb and Jens Weber in Within (Labyrinth Within). Within (Labyrinth Within), a new dance and film work by the Swedish choreographer Pontus Lidberg, begins quietly. Lidberg lies on his side at center stage, his back to the audience. Surrounding him are three red poppies sprouting from the floor. Slowly and softly, he begins to move, rolling over, tracing soft semi-circles with his feet, lifting his arms occasionally into fifth position. He seems, above all, vulnerable and alone. Four other dancers soon join Lidberg, but even when the stage becomes crowded, a sense of detachment prevails in this complicated hour-long, ballet-inflected piece, which was given its New York premiere by Morphoses at the Joyce Theater last week. In a recurring group passage, for example, the dancers lean against one another or walk under bridges formed by limbs, their steps unfolding to a steady rhythm, but any bonds formed are fleeting. Watching them dance together is like watching water pass through fingers. Isolation pervades even the partnering. An early pas de deux finds Adrian Danchig-Waring (a soloist with New York City Ballet) and Laura Mead trading passive and aggressive roles, never managing to reach harmonious middle ground. With a quick push, Mead sends Danchig-Waring falling to the floor. He shows no trace of emotion. When Danchig-Waring carries Mead, her body becomes as rigid as a plank. It’s the choreographic equivalent of bickering; although they try to be heard, each might as well be addressing a wall. 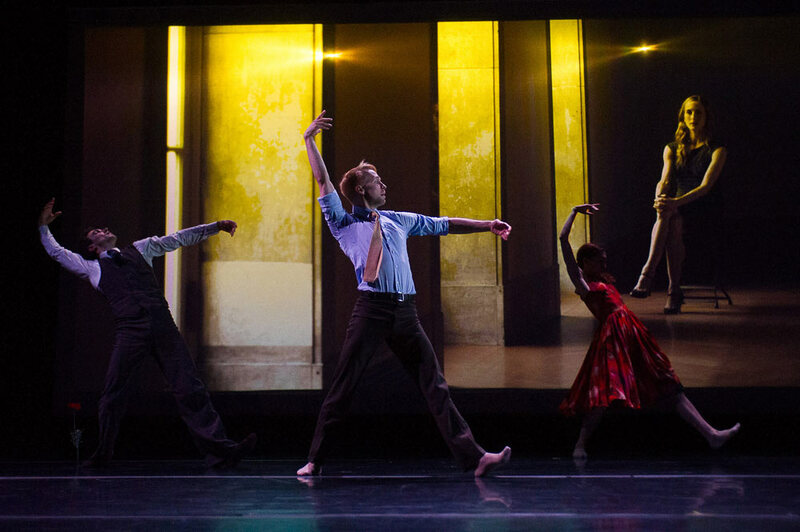 Within (Labyrinth Within) – Jens Weber, Pontus Lidberg, Gabrielle Lamb and Wendy Whelan (seated, in film). The former approach – of mixing film and live performance – fares better. 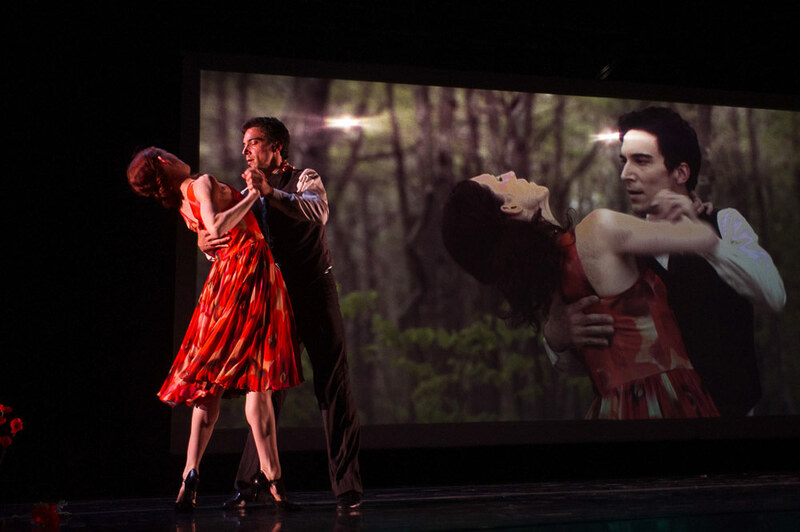 Jens Weber and Gabrielle Lamb dance a duet alongside filmed versions of themselves dressed in the same costumes. A framed mirror depicted on screen often reflects their dancing as a real mirror would, but the live performers sometimes break abruptly with their doppelgangers. On screen, Weber balances Lamb on his shoulders as the real-life couple briskly walk offstage. The doubling of performers – and their fragmentation – adds another edge to Lidberg’s meditation on missed connections. The full-length film, Labyrinth Within, which features Whelan and Giovanni Bucchieri alongside Lidberg, also explores isolation and strained relationships, albeit in more explicit terms. The performers don’t speak, but the film offers a story of sorts. Bucchieri’s character suspects his wife (Whelan) of infidelity – and rightly so: She meets with Lidberg in hidden rooms, tying herself in knots with her partner, while her husband is away. The mysteries are tantalizing. Is the affair imagined? Does an introductory scene showing two sweaty men groping – their faces obscured – suggest that the husband has secret urges and is jealous of his wife’s fling? The film, however, is ultimately undone by a sappy conclusion and self-conscious chicness: the high-fashion costumes, overly slick production values, and melodramatic score distract from the dancing and make the film seem too often like a perfume commercial. Liza Voll in Within (Labyrinth Within). These performances marked the end of an era for Morphoses, a company already well acquainted with change. The ensemble was founded jointly by Lopez and Christopher Wheeldon in 2007, and after Wheeldon’s departure three years later it embraced a new model, hosting a different resident artistic director each year to work with the company and choreograph a new work on its dancers. 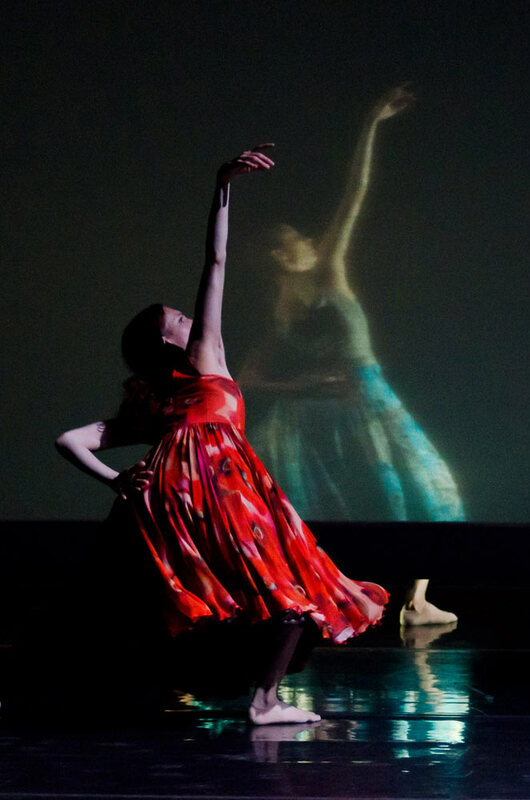 Lopez, who took the helm of Miami City Ballet in September, has stated that Morphoses will follow her there, possibly to become the traditional ballet company’s experimental wing. Within (Labyrinth Within) is no masterpiece, but it presents exciting possibilities for contemporary ballet while avoiding the hyperextended steps and sexual clichés that muddy so much of the field. If the pieces Lopez brings to her new company are in this vein, Miami will surely benefit from her innovative spirit.